With its hundreds of square yards of canvas sails making it the most effective means of harnessing inorganic energy in the pre-industrial world, the sailing ship was an essential transportation technology in the western world until the mid-19th century. Given the strong incentives, both military and commercial, to improve the performance of such vessels, it may come as a surprise that the consensus among economic (but not maritime) historians since the work of Douglass North (1968) is that until iron steamships appeared in the mid-19th century, maritime technology was more or less stagnant for 300 years. Previous efforts to measure technical progress at sea have been indirect, looking at things like changes in the cost of shipping freight or the length of voyages (Solar 2013). In a new paper we take a different approach, looking directly at how the speed of ships in different winds improved through time (Kelly and Ó Gráda 2018). We can do this thanks to an ambitious, but abortive, climatological project called CLIWOC (Wheeler et al. 2006). This attempted to reconstruct oceanic climate conditions between 1750 and 1850 by collecting records from 280,000 log book entries from British, Dutch, and Spanish ships. These give daily information on the ship’s location, wind speed, and direction that allow us to estimate how fast a ship sailed on a given day. 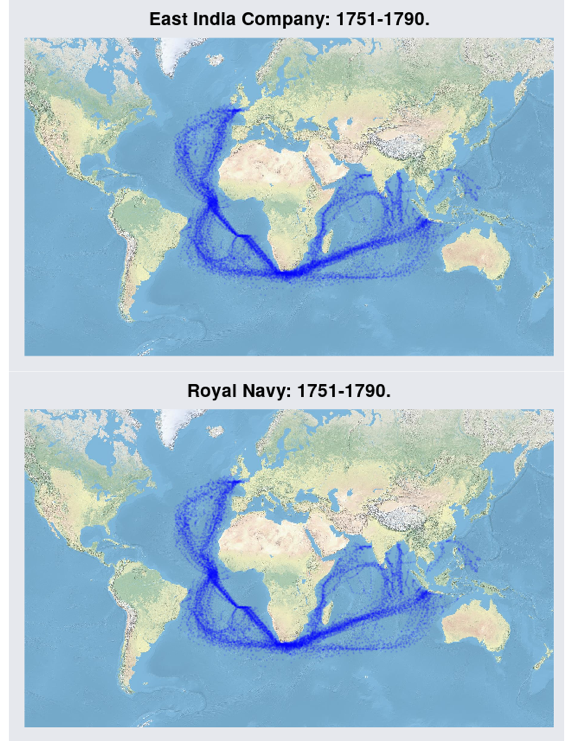 Figure 1 plots the daily positions of ships of the British Royal Navy and East India Company for several decades before the Napoleonic Wars, showing the long loops taken by these vessels as they followed prevailing winds and currents. The slow speeds at the equator can be seen by the way that points bunch there, and also at the southern tip of Africa, as ships made the difficult eastern run around the Cape of Good Hope. 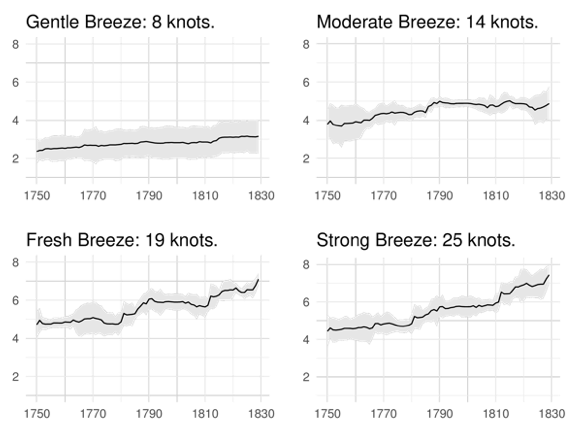 Figure 2 (estimated by a generalised random forest to allow for possibly non-linear interactions between year, position and wind conditions) shows how the speed of East India ships rose by around half between 1750 and 1830, apart from dips during wartime when they sailed in slower convoys. However, we can also see that these ships sailed slowly. Even by the 1820s in a moderate or fresh breeze – the usual summertime conditions in the north Atlantic – they could only manage 5 to 7 knots. Royal Navy ships experienced similar improvements, unlike Dutch and Spanish vessel counterparts. In fact, Dutch ships crawled to the East Indies as slowly in 1790 as they had in 1600, with over 5% of passengers and crew still dying in the overcrowded conditions and tropical heat of a typical voyage. What explains these substantial improvements in British ships? The jump in the 1780s is due to the copper plating of hulls which stopped fouling with weed and barnacles, and over the entire period there were continuous improvements in sails and rigging. A big contribution after 1790 came from the increasing use of iron joints and bolts instead of wooden ones (as well as replacing traditional stepped decks with flat ones fitted with watertight hatches) which made for structurally sounder ships that could safely set more sail, especially in stronger winds. For the last generation, the dominant view among economic historians has been that the Industrial Revolution of the late 18th century was anything but revolutionary, with innovation limited to the initially small sectors of cotton, iron, and steam, with other sectors mired in stasis. However, a growing literature now highlights how widespread progress occurred across the British economy in sectors as varied as pottery, steel, printing and paper-making, water-power, gas lighting, watches, machine tools, and, as we have seen here, shipping. Kelly, M, and C Ó Gráda (2018), “Speed under Sail during the Early Industrial Revolution”, CEPR Discussion Paper 12576. North, D C (1968), “Sources of Productivity Change in Ocean Shipping, 1600-1850”, Journal of Political Economy 76, 953–970. Solar, P M (2013), “Opening to the East: Shipping between Europe and Asia, 1780-1830”, Journal of Economic History 73, 625–661. Wheeler, D, R Garcia-Herrera, F B Koek, C Wilkinson, G P Können, M R Prieto, P D Jones, and R Casale (2006), "CLIWOC, Climatological database for the world’s oceans: 1750 to 1850", Brussels: European Commission.